5W-340W Polycrystal Solar Panel is made up of high quality solar cell with high efficiency and transmission rate, low iron tempered glass, anti-aging EVE, high flame resisitant TPT and anodized Aluminum alloy. Manufactory with IEC61215 standard, could widely used insolar power station, building, solar street lighting, the solar panel has photovoltaic cells inside, which converts solar energy into an electrical current, A solar panel's effectiveness depend on the size and quality of the solar cell and the transparency of the protective cover/glass. Looking for ideal POLY Solar Panels Manufacturer & supplier ? We have a wide selection at great prices to help you get creative. All the POLYCRYSTAL SOLAR PANELS are quality guaranteed. 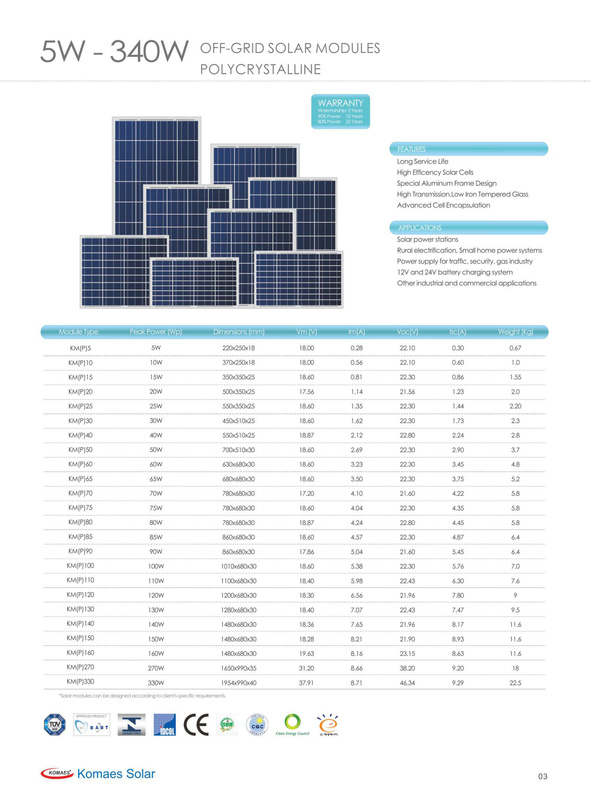 We are China Origin Factory of OFF-GRID Polycrystalline Solar Panel. If you have any question, please feel free to contact us.